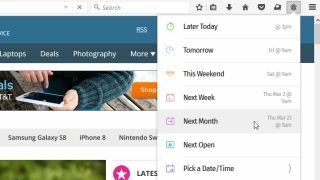 Mozilla has added a new tab-snoozing feature to Firefox Test Pilot – a program that gives users a taste of experimental browser add-ons. SnoozeTabs lets you dismiss open tabs temporarily, then restore them automatically after a certain period. It’s brilliant if you come across something interesting that you want to check out later, without the hassle of bookmarking it. To try it yourself, install the Test Pilot extension, then select SnoozeTabs from the main menu. A small alarm bell icon will appear in the toolbar. To snooze a tab, click this icon to hide it and choose when it should reappear – in a few hours, a few days, next time you reopen Firefox, or at a custom time and date. Test Pilot is a playground where you can try experimental features before they’re integrated into Firefox proper (or consigned to the great plugin repository in the sky). Mozilla offers users a selection of new tools and give feedback, which it can then use to develop or ditch ideas. Some might become fully integrated parts of the browser, whereas others might evolve into optional extensions. Test Pilot is an add-on rather than a whole new version of Firefox, so you can easily give it a try and remove it later. Are you getting the best online experience? Check out out guide to the best web browsers of 2017.